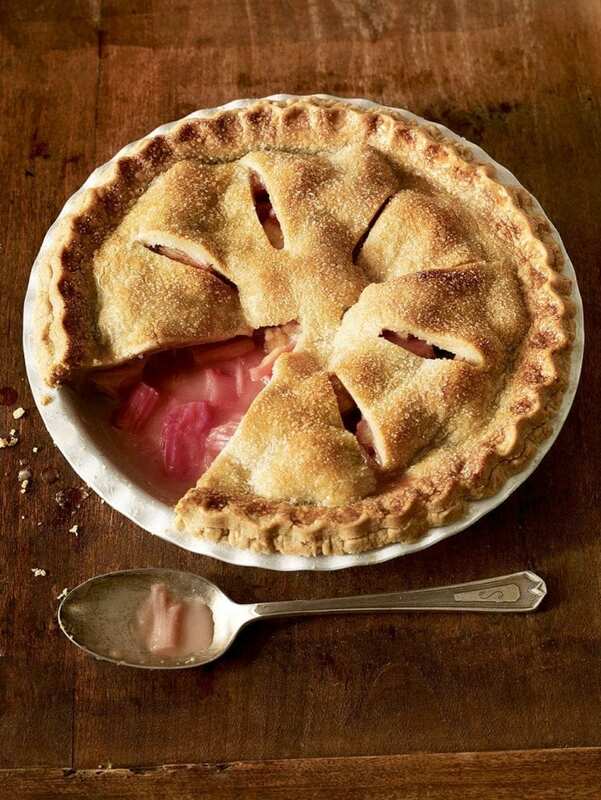 This American style pie makes great use of rhubarb, a classic British favourite, and enlivens it with a gingery kick. For the pastry, remove the butter from the fridge and leave it to come to room temperature for 20-30 minutes. It’s ready when it feels like plasticine/putty (don’t let it get too soft). Cut it into small pieces. Roll out the dough, using a well-floured rolling pin on a lightly floured surface, into a rectangle measuring about 12cm x 30cm. Brush away any excess flour from the top with a pastry brush, fold the bottom third of the pastry up and fold down the top third, brushing away any excess flour as you do, to make a 3-layered pastry block. Give it a 90-degree turn, then roll out again to a 12cm x 30cm rectangle. Repeat the folding and rolling 4 more times, then fold once more and divide in half. Flatten into discs, wrap each in cling film, then chill for 30 minutes. For the pie filling, wipe the rhubarb sticks clean and trim off the ends. You should be left with approximately 675g. Cut the rhubarb stems into 2.5cm pieces, then toss well with the grated ginger in a mixing bowl. Mix the caster sugar with the flour, stir into the rhubarb and set aside for 10 minutes, stirring now and then, until the flour and sugar mixture has become moist and clings to the fruit. Meanwhile, put a heavy-gauge baking sheet on a rack in the middle of the oven and preheat to 230°C/fan 210°C/gas 8. Lightly grease a 24cm x 3cm deep non-stick pie dish with a little butter. Roll out each piece of chilled pastry on a lightly floured surface into a 28cm disc. Use one disc to line the pie dish, pressing it well onto the sides, base and rim. Brush the edges with a little beaten egg, then spoon in the rhubarb filling. Lay the second disc over the pie and press the edges together well to seal. Trim away any excess pastry, then crimp the edges with your fingers to give an attractive finish. Make eight 6cm slits in the lid of the pie, like the spokes of a wheel, (leaving a 7cm disc intact in the centre and finishing about 2.5cm short of the rim). Brush the lid with beaten egg and sprinkle over the granulated sugar. Slide the pie onto the hot baking sheet in the oven and bake for 15 minutes. Lower the oven temperature to 180°C/fan 160°C/gas 4 and bake for a further 40-45 minutes until the juices start to bubble up through the slits. You’ll need to cover the pie loosely with a sheet of foil after about 20-25 minutes, once the pastry is richly golden. Remove and leave to rest for 30 minutes. Serve warm, cut into wedges, with stem ginger ice cream. Make sure your rhubarb is firm and, if possible, choose stalks with a deep pink hue so your finished pie filling has plenty of colour too. The pastry sounds more complicated than it is. After you’ve made it once and know what to expect, it’s a cinch (honestly) and gives the perfect crisp crust for this American-style fruit pie. I love this recipe because I like both Rhubarb and Ginger. Adding them together is delicious. I love this recipe because it tastes delicious and evokes memories of my grandmother who used to make this and other fruit pies every Sunday for our extended family tea.